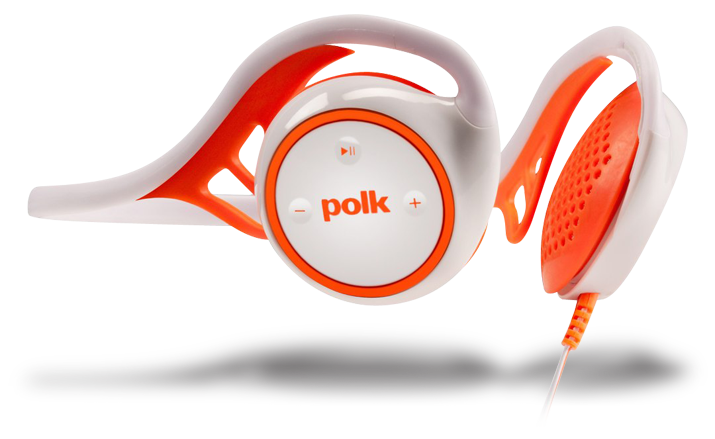 When Polk Audio announced its UltraFit line of sports headphones, a glance at the spec sheet told me right away that I’d have to try them out. It seemed that Polk, which has earned great respect for its high-quality loudspeakers, had really thought out and corrected many of the problems that plague headsets designed to be worn during sports activities. I chose the UltraFit 2000 on-ear model ($69.95 USD) because it suited my needs for my athletic endeavors; the UltraFit line is filled out by the 500 ($49.95) and 1000 ($59.95) in-ear models, and the 3000 in-ear-canal model ($99.95). All are moderately priced and offer features not usually found in the everyday sports headphones I’ve seen. You get plenty: the UltraFit 2000s themselves; a built-in, three-button remote control for an iPhone, iPod, or iPad; a built-in microphone; a 46”-long flat cord; a water-resistant protective case; a pair of silicone earpads; an extra pair of foam earpads; a pair of shearling earpads for cold weather; a Nokia connection adapter; a shirt clip; and a manual and quick-start guide. The 2000s weigh a mere 2.5 ounces and measure 6” x 3.5” x 2.25” when not worn. Polk’s published specs include: frequency response, 20Hz-23kHz; sensitivity, 105dB; and impedance, 32 ohms. The drivers are Polk’s Dynamic Balance transducers. Connection is via a 3.5mm plug. The UltraFit 2000s are available in two color combinations: black and red or white and orange. If you’ve read my series “Music Everywhere,” you’ll know that, like Perceval searching for the Holy Grail, I’m on a quest to find the perfect Bluetooth-enabled headphones -- I’m not fond of cords while I work out. That said, the UltraFit 2000s’ 46” flat cord lived up to Polk’s claim that it’s nonintrusive. After going in and out of my gym bag and on and off my head many times, the cord never once got tangled. Also, Polk has reinforced the connection of cord and headphones, which is usually problematic due to subpar connectors. In fact, though the UltraFits look stylishly delicate, I found them so strong that, even after a dozen workouts, I could have sold my pair on the street as new, with none the wiser. That’s impressive build quality for such a small, light item. The cord terminates in a 3.5mm connector that fit perfectly into my iPod Nano and iPod Touch. It goes in most of the way, then you give a little push and it locks. It never came loose at any point in my workouts. Behind each earcup is an ear hook, to ideally position the cup on the ear. As is always the case with one-size-fits-all headphones, I’m sure there are heads somewhere that the UltraFit 2000s won’t perfectly fit, but this set is so well designed that I suspect such heads are rare. I found the Polks very comfortable; had it not been for the music I was hearing, after a few minutes I’d have forgotten they were there. I’d thought the Polks might be hot to wear while working out -- other on-ear ’phones I’ve used have been quite warm. But the UltraFits weren’t, and their built-in moisture guards worked perfectly. Even if you perspire a lot, the 2000s should remain securely on your head without having to be readjusted. As a rule, I prefer a neckband design, and this one was just fine; it never rubbed but stood clear of my neck, though never so far that it got in the way of my exercising. Even when I worked out vigorously, deliberately trying to dislodge the Polks, they stayed put. Using the click control built into the right earcup, you can adjust volume, pause, and skip tracks forward and back. The markings are enhanced with slight indentations; you can feel them when you can’t see them. Tap once to pause, again to resume, twice to go to the next track, and three times to replay a track or return to the previous one. These commands were easy and intuitive to use, and worked every time. I even stumbled on a feature of my iPod Nano that I hadn’t realized it possessed. If I tapped once to pause, then twice while in pause, an announcer told me what the next song was. I’ve been spoiled by Bluetooth -- needing no wires, I can put wear my Nano on a wristband and, to see what’s playing, just look at it as I would a watch. This is uncomfortable with a cord, so I clip the Nano to my waistband or put it in a pocket -- where I can’t see it. The announced titles made it possible to find a track without having to see the Nano: a big help. The 2000’s volume controls take over those on your audio device, eliminating the need to set levels on two devices. 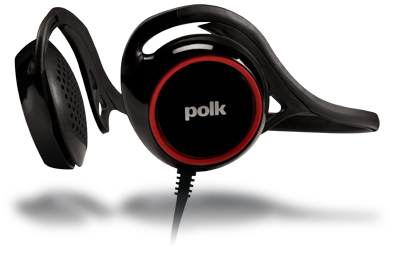 Although Polk supplies several different earpads with the 2000, none of them cancel out noise, and that’s a good thing. I work out in the relative safety of a gym, but others use headphones while running or biking, when they have to share space with cars and trucks. Believe me, you want to hear those sounds; otherwise, you court disaster. The UltraFit 2000s blocked off enough noise that my music masked most of what remained, but I could hear ambient sounds when I needed to. The Polks played as loudly as anyone could want, though they did start to distort a little when turned all the way up. I listened at a level two clicks lower than that, and it was plenty loud, with no audible distortion. The UltraFit 2000s sounded about the same no matter which set of earpads I used, so I settled on the sweat-fighting silicone pair. The ones for winter wear are almost like tiny earmuffs, and will come in handy for those who bike or run outside in the colder months. It seems that Polk has thought of just about everything. I was very impressed with the audio quality of the UltraFit 2000s. My iPod Nano has nearly two dozen EQ settings; I played around with them all and concluded that the Polks had a neutral balance. If the sound was “too” anything (shrill, muddy, etc. ), it was due to the source equalization, not the UltraFit 2000s. At first I thought the bass was deficient, but quickly concluded that the other headphones I’ve auditioned were bass heavy. The Polks were relatively flat in the bass. If you want more bass, you’ll have to pick an appropriate EQ setting on your player. I settled on the Nano’s Rock setting for the music I play during workouts. The beginning of “Hurts So Good,” from John Cougar Mellencamp’s American Fool (16/44.1 ALAC, Island/Mercury), had solid drums and guitar capped by a shining, shimmering struck cymbal. The raucous piano in “One Angry Dwarf,” from Ben Folds’s Live (16/44.1 ALAC, Sony), had plenty of rock ’em, sock ’em presence, but also a lot of clarity -- a clean, focused sound that didn’t buckle under when the singing started. The title track of Christian Kane’s The House Rules, an energetic country-rock anthem (16/44.1 ALAC, Big Picture), had awesome thumping bass perfect for any number of strength exercises. Though I’ve found it futile to try to listen to classical music during a workout, I did listen to some at home using my iPod Touch. Beethoven’s Symphony No.5, performed by Ernest Ansermet and the Suisse Romande Orchestra (16/44.1 ALAC, Decca Eloquence), had a neutral balance among highs, mids, and lows -- just the kind of sound I’d expect from a pair of good loudspeakers. At this point I came to the conclusion that though the UltraFit 2000s were designed with sports in mind, they were good enough to use while working at a computer. Polk Audio’s UltraFit 2000 headphones lived up to the high expectations excited by their spec sheet. They’re comfortable, durable, and intuitive to use. Polk provides different earpads to fit different folks and situations, and the ’phones provide solid, evenly balanced sound with great overall clarity. They sit stylishly and comfortably on the head, and won’t come loose during rigorous exercise. If Polk made a Bluetooth model that sounded and acted like the UltraFit 2000s, my quest for the perfect sports headphones might come to an end.